1) The nose: The porpoises have a short and blunt nose. It is not pointed like Dolphin's nose. The Dolphins usually have a pointed nose (snout). 2) The teeth: Have flat, spade shaped teeth with upper edges. Upper edges are long and sharp. Have pointed and cone shaped teeth. 3) The fins: The porpoise's fin is like a shark's fin (triangular). The leading edge of its back fin is straight. The leading edge of the Dolfin's back fin is like a curling wave. It is called a dorsal fin. 5) Shape: Shorter and compact in shape. Longer and sleeker in shape. 6) Behavior: Porpoises are very shy in nature. They are not generally seen wild or captive . They are rarely seen at surface when come to breathe. Dolphins are more friemdly with humans. They don't fear and ride the waves alongside boats. 7) Sounds: Porpoise's sounds are not audible to humans. Dolphins produce audible sound and also talkative. 8) Groups: Porpoises live in small groups. (Generally 2-4 in one group). Dolphins live in large group. 9) Habitat: Propoises are found only in Pacific. Dolphins are found in all oceans. 11) Lifespan: The average lifespan of propoises are 15 years. The average lifespan of dolphins are 50 years. Sometimes more than this. Porpoises and Dolphins, both are the marine mammals and closely related to whales. Porpoises, belonging to the Phocoenidae family, smaller and stouter while Dolphins, which belong to the Delphinidae family are larger. Both animals are very intelligent and prefer to live in groups. 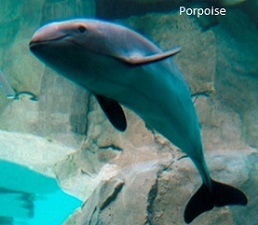 Porpoises: Porpoises are related to Whales and Dolphins. Sometimes, Porpoises are termed as small dolphins by sailors and fishermen, but both are different. The most visible difference is that porpoises have shorter beaks and flattened, spade-shaped teeth which is totally different from Dolphins' conical teeth. Porpoises are divided in 6 species. They live in all oceans, mostly near the shore. Generally they are less acrobatic and sexually more aggressive than Dolphins. 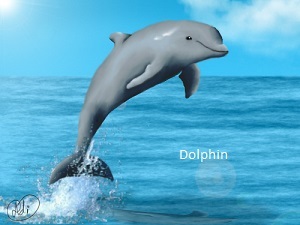 Dolphins: Dolphins also are related to Whales. There are almost 40 species of Dolphins around the world. They live in groups known as school or pod. The male Dolphins are called "bulls" female "cows" and the younger dolphins are known as "calves".